The government on Tuesday approved next year’s budget bill, which would see the biggest year-on-year increase in a decade. The bill, approved by the Cabinet on Tuesday, calls for a budget of 470.5 trillion won ($423.5 billion), up 9.7 percent from this year. This is the largest on-year increase since 2009, when the annual budget was raised by 10.7 percent from the previous year, due largely to difficulties caused by the global financial crisis. In comparison, government revenue is expected to rise 7.6 percent from this year aided in large part by increased tax revenues. According to government projections, next year’s overall revenue will reach 481.3 trillion won, while an increase of 11.6 percent is expected in its tax revenues. According to government officials, the large increase is aimed at shoring up the Moon Jae-in administration’s economic policies, and does not imply that the government considers the current economic situation to be as critical as that of 2009. 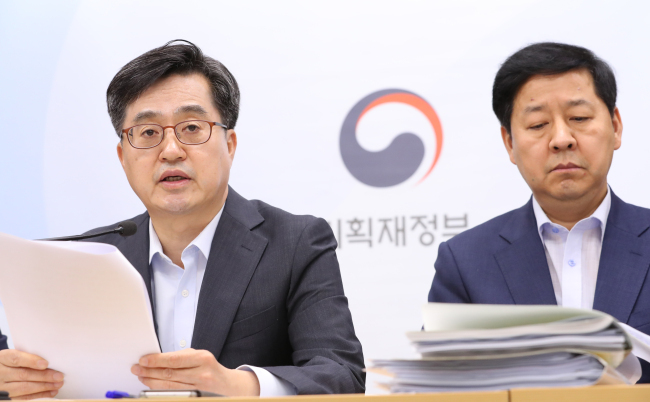 Speaking at a briefing last week, Finance Minister Kim Dong-yeon said that government expenditure needs to be raised to support efforts to reform the structure of the country‘s economy. “The three central pillars of that change are income-led growth, innovative growth and fair economy,” Kim said, adding that fiscal policy needs to be modified in tandem with the changes being sought. A large part of the rise is accounted for by the welfare-related budget, which the government would raise from this year’s 144.6 trillion won to 162.2 trillion won. If approved by the National Assembly, welfare-related spending will account for 34.5 percent of government expenditure in 2019, up 0.8 percentage point from this year. The budget for employment-related issues, which has come as a major hurdle for the Moon administration, could see an increase of 4.3 trillion won, or 22 percent, from this year to come in at 23.5 trillion won. Government expenditure earmarked for industrial issues has also been increased by 14.3 percent to 18.6 trillion won, with 3.7 trillion won and 2.8 trillion won set aside for aiding innovative industries and small merchant, respectively. Other areas with significant budget increases planned include defense and research and development. According to the budget bill, the defense budget will be raise by 8.2 percent to 43.2 trillion won as the government continues the drive to strength the country’s military capabilities. As for the government R&D budget, it is set to break the mark of 20 trillion won for the first time if the bill is approved by the National Assembly.